The Garage48 Tech for Humanity kicked off yesterday night with a room full of inspiring people and world-changing ideas. There are over 90 participants and 15 mentors, from all over the world. Many NGOs and organisations - people working in these fields every day came on board with their challenge as well. Garage48 has been working with developing countries like Ukraine, Belarus, Moldova, Georgia, Uganda, Kenya, Nigeria, Ghana, Palestine, Lebanon for several years. Helping to develop the tech communities in these places we have never failed to be amazed by the energy that the local people have despite any hardships or local policy or issue. 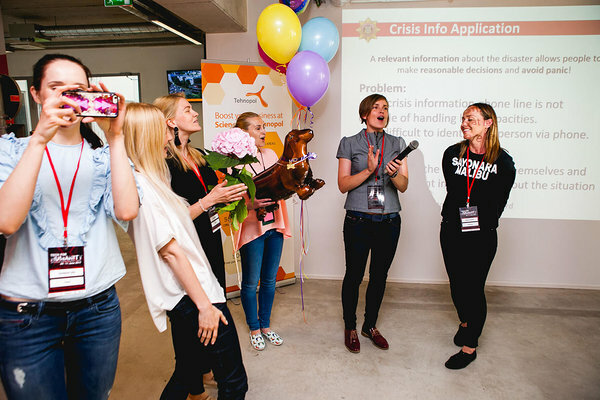 We were extremely happy and excited when Estonian Foreign Ministry of Affairs approached us and suggested that we should organise a hackathon on solving humanitarian problems. We teamed up with Tehnopol, who was a big part of making this event happen and voiá - Tech for Humanity was born. There are over 7 billion people in this world and even though we cannot solve all their troubles, we can take a weekend to bring attention to the people who might not have a voice themselves. The weekend hackathon has three areas of focus: natural disaster relief, the refugee crisis and making the life quality better in developing countries. For disaster areas where the need for quick infrastructure is high. Plastic bricks have come up with an idea to make real-life-Legos to build the most necessary things in the disaster areas, such as hospitals, houses and much more. A platform that connects refugees with a volunteer to help them. You don’t have to be a long-term volunteer, with Humanizer you can choose who and when and for how long you want them to help. It's like human AirBnB or HumanUber. We need to make fab lab in order to prove the skill that they have or want to learn. We need to have some kind of model or concept of how we can do it and present it. This will help to make the education better and increases the knowledge in the country. A platform with access to an electronic library of models, mind maps and calendar to filter important things and boost motivation. MTÜ Mondo is pointing out that there are a lot of services in refugee camps. But the services are badly announced. NGO Mondo wants to build an app that allows the refugees information about their surroundings, gives them opportunities to information about what is happening around them. Estonian refugee council is looking for a matching tool to profile the refugees in Estonia. One of the issues we are seeing is that refugees are randomly based in the Estonia. We need a matching tool to profile refugees, to understand the skills they have together with their educational background. This can be then overlapped with a map, which shows the cities that can offer them a place to work. We want to create a system that combines a labour market, employee skills, languages courses and much more to help out the government. Matching refugees with municipalities on objective data and algorithms. Webpage app that will allow people in a crisis area to mark themselves safe. This can assist rescuers with information about the situation and also it can allow the people at the location to be notified about rescue information. This can help the most vulnerable people, such as elderly, children or people in the areas of floods. Emergency workers will be notified through the system where the people in need are located and how many people are in need of help. Life coaching experience on your Messenger for a small subscription fee. To have a meaningful and purposeful life. Online mentor to help people. Firefly is all about humanitarian aid. They provide a universal web-based platform for disaster zones and NGOs to connect and share details about the crisis. Their aim is to improve cooperation and efficiency in the humanitarian sector to provide the necessary aid. Some of the ideas that were left out: a platform, to help the victims of anorexia and bulimia, grant management system, a social platform for all the refugees to communicate with each other, e-residency for refugees and much more. Stay tuned on how they are doing over the weekend. Follow us on Instagram, Twitter and Facebook and don’t forget the LIVE STREAM of the Sunday pitches at 5:30 pm GMT +3. You will find the link on Garage48 FB page!